The Singer Model 3116 is named Simple because it was designed to be a cinch to use no matter what your level of expertise. The machine features fewer adjustable features than other Singer models and works well for teaching a student basic sewing techniques. The machine has 18 built-in stitch patterns and comes with a healthy supply of accessories, including a zipper foot and a quilt guide, which can help you complete almost any basic sewing project. Place a spool of thread on the spool pin on the top right side of the back of the machine. Pull approximately 6 inches of thread from the spool. Place the spool holder over the spool pin to keep the thread in place. Continue pulling the thread toward the left side of the machine, and snap the thread into the thread guide located next to the handle of the machine. Wrap the thread in a clockwise direction around the bobbin winder tension disk that is located just to the left and slightly forward from the thread guide. Place the end of the thread through the hole on the bobbin, and hold it in place. Snap the bobbin onto the bobbin spindle, and push the spindle to the right. Continue holding the end of the thread that is extended through the hole on the bobbin. Press the foot pedal to wind thread onto the bobbin. Once the bobbin has several rounds of thread on it, you may let go of the thread you are holding. Continue winding until the bobbin is full. Cut the thread and press the spindle to the left. Remove the bobbin from the spindle, and raise the needle to its highest position by turning the hand wheel on the right side of the machine. Place a spool of thread on the machine as indicated in Steps 1 and 2 of Section 1. Guide the thread through the pre-tension spring located about 2 inches left of the thread guide. Lead the thread down the right side of the channel that is even with the pre-tension spring then lead the thread it back up the left side of the channel. Guide the thread from right to left through the take-up lever at the top of the left channel and then back down toward the needle housing. Pass the thread behind the thread guide, located just above the needle housing, and then behind the thin wire needle clamp guide that is on the needle housing. Thread the needle from front to back with the thread. Pull approximately 6 inches of thread toward the back of the machine. Pull a few inches of thread from the bobbin. Place the bobbin into the bobbin case with the thread running in a clockwise direction. Place the extended thread through the slit and underneath the finger on the bobbin case. Insert the bobbin case into the shuttle located beneath the needle housing. Turn the hand wheel to lower the needle while holding the thread from the spool. Continue turning until the needle comes back up. Pull the thread from the spool towards the back of the machine, and a loop will arise from the bobbin case. Use your finger to grab the loop, and pull it gently toward the back of the machine until approximately 6 inches of thread is extended. Attach the correct presser foot by unscrewing the pin just above the presser foot, setting the presser foot in place and screwing the pin back in place. Use the foot already installed for most projects and the zipper foot or buttonhole foot when sewing zippers or buttons. Place your sewing project under the needle housing. Lower the presser foot using the lever on the back of the machine. Press the foot pedal slowly and begin sewing. You may increase speed based on your comfort level. The more pressure you apply to the foot pedal, the faster the machine will sew. 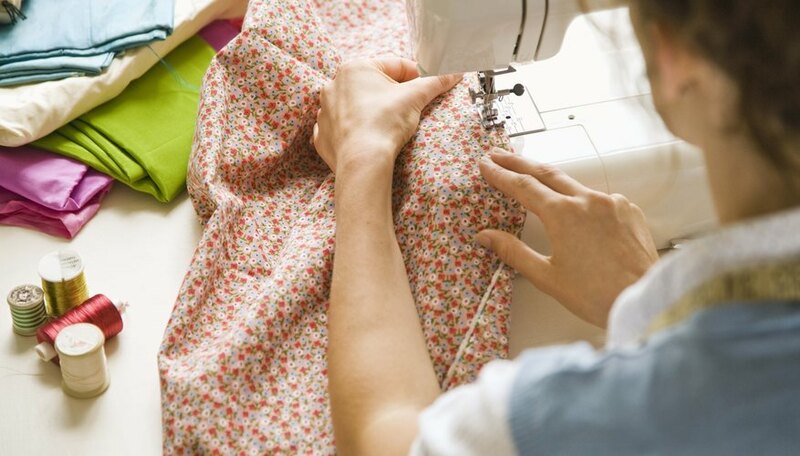 Continue sewing until your project is complete.